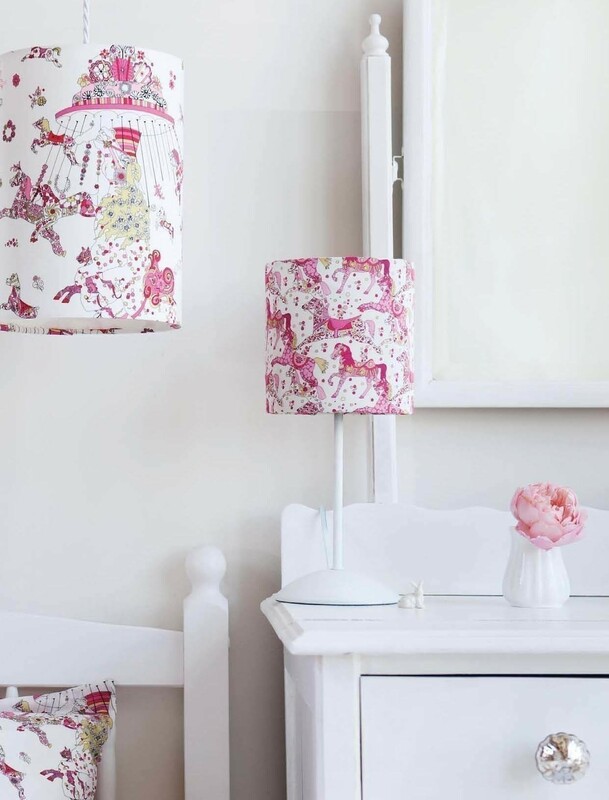 What better way to light up a room in style than with a patterned, handmade lampshade? Choose your fabric to co-ordinate with your tiny oneís bedroom, and have fun picking out her favourite colours. You could match the Lilly duvet and pillow set, or delightfully mismatch. This shade could be on a bedside lamp or work as a drum shade in the centre of the room. 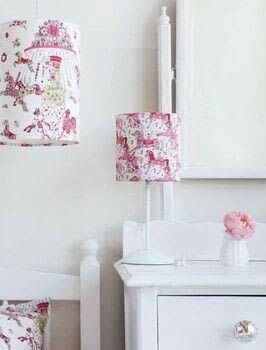 Bespoke lampshades look so amazing and professional, you might even find yourself making a grown-up version for your own room. First a note about self-adhesive lampshade panel. It is a stiff/rigid PVC and one side has a self-adhesive with a backing paper that you peel off when you want to stick fabric to it. that will give a softer, more subdued bed-time-reading-atmosphere light. Self-adhesive lampshade panel: cut 65 x 29cm (251/2 x 111/2in). Fabric: cut 77.5 x 32cm (261/2 x 121/2in). 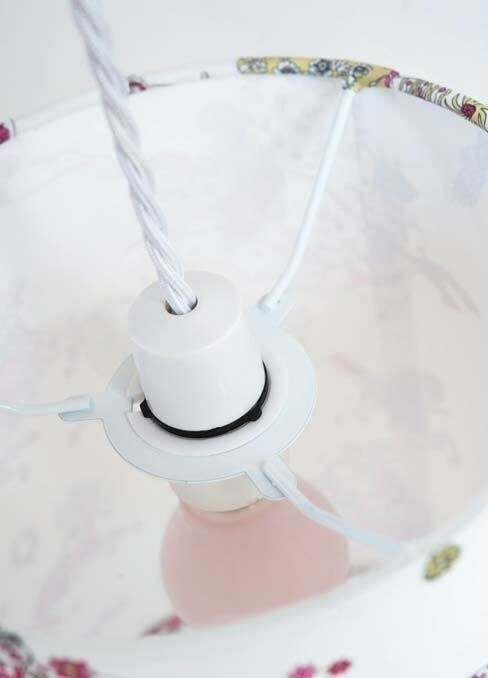 To make your choice of lampshade size: cut the self-adhesive lampshade panel so it is the circumference of your lampshade ring plus 1cm (3/8in) long by the desired height of your lampshade plus 2.5cm (1in), and cut your fabric so it is the circumference of the ring plus 4cm (11/2in) by the desired height plus 5cm (2in). Posted by FW Media • Published 25th May 2015 • See FW Media's 76 projects » © 2019 Alice Caroline / David & Charles · Reproduced with permission. Take the lampshade panel and, on the side without 1the self adhesive backing, score a line all along, 1cm (3/8in) from the top long edge. Use a craft knife and take care not to cut all the way through. Repeat 1cm (3/8in) from the bottom edge of the panel. from the centre, sticking the panel to the wrong side of the fabric. Trim the excess fabric off all around, in line with the lampshade panel. Crack the lampshade panel backing along the 3scored edge by bending it back and forth, and peel off the self-adhesive strip to reveal the fabric beneath. Repeat at opposite edge. Stick a line of double-sided tape to the wrong 4side along one short edge of the fabric-backed lampshade panel. Stick some double-sided tape to the outside edge 5of both the lampshade rings, keeping the ring in the centre of the tape. Peel the backing paper off the tape and curl the edges of the tape around the ring. 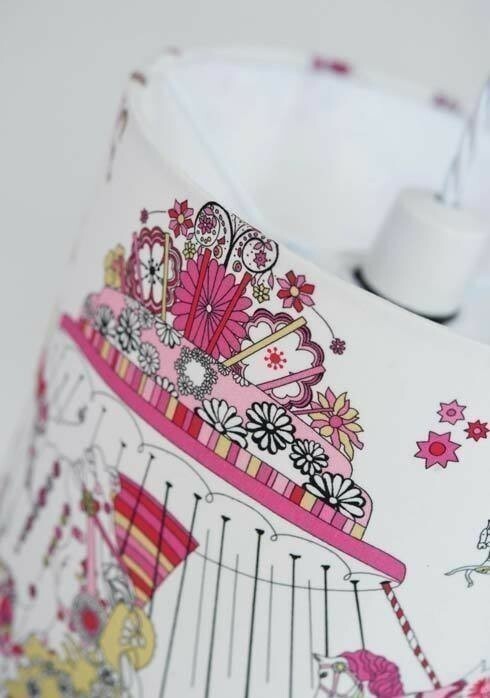 If you have a directional print fabric that you would like a certain way up when the lampshade is finished, ensure that the lampshade ring with the light-bulb fitting is inside the lampshade and positioned at the correct side. Peel the backing paper off the tape you applied 7in step 4 and overlap it onto the other end of the lampshade panel. With the join on a flat surface, press down hard on the join to stick it together. Snip the fabric edge in line with the struts of the lampshade light-bulb fitting ring so that the fabric can fold past them. Fold the excess fabric edge around the ring towards the inside of the lampshade, keeping it stretched tight to avoid puckering. Push the fabric edges up behind the ring and smooth with the corner of a ruler. Repeat at the opposite end of the lampshade to complete your new bedroom accessory.